Prepaid fares - How does it work? After authorizing PayPal payments from the app, you can select prepaid amount up to $40. 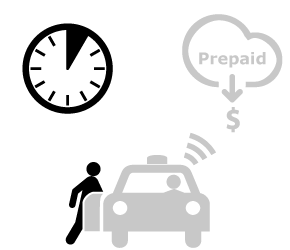 The prepaid amount is automatically transferred to the driver's account if your cab reaches the pickup location within 10minutes. 3. You pay the balance when exiting the cab. The driver will deduct the prepaid amount from the fare. You pay the balance with usual forms of payment. Prepaid fares are attractive: more drivers will be competing for your business, and you get a more reliable service. Drivers will have a good reason to pick you up before the prepay guarantee expires, you get serviced faster. You don't pay anything unless you get fast, reliable service, you can't lose! Here's how it works: prepaid fares get more attention from drivers because the guaranteed minimum payout makes them significantly more attractive than an ordinary fare (customers no-show are a big deal, especially in some cities where customers have a propensity to order a cab, then drive off in the first Taxi they can hail). Are prepaid fares more expensive? The driver will deduct the prepay amount from the fare when you exit the taxi, so the net cost of the fare itself is unchanged (meter + tip). The extra cost to you is our $2 fee ($2 for a $10 prepay, $3 for a $20 prepay). How much should I prepay? The standard prepay amount is $10 and in most cases it is enough to be effective. If however you find yourself needing to make a stronger argument with Taxi drivers, we recommend upping your prepay bid to $25 - or even more depending on the value of your fare. 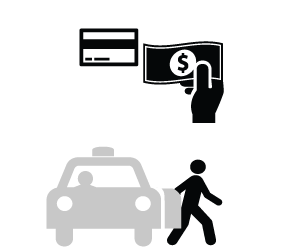 You will find that prepaying a more than $10 makes a difference if you are nowhere near the Taxis' usual route or if it's Friday night and Taxi drivers have plenty of $10 to $20 fares to keep them busy. Is the 10min pickup guaranteed? 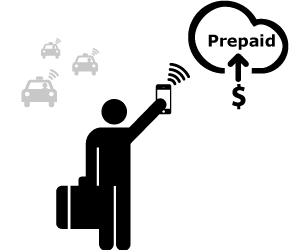 Drivers are independent contractors who make their own choices based on time Vs money, there are no absolute guarantees. By the same token, they are much more likely to see a prepaid order all the way through rather than take a chance on a non-prepay customer that may or may not show up. What if the driver shows up after 10min? You will not be charged if the driver is late. The prepay transaction is simply voided after the 10 minutes expire, and the order is converted into a standard order (of course you can still choose to get in the cab, and pay the normal amount -meter + tip- when exiting). What if I cancel the fare? If a driver already accepted the fare, and the estimated time of arrival is within the 10 minutes limit, you will be charged for the prepaid transaction to compensate the driver for time & gas. What if drivers don't pick up my fare? You will not be charged the prepay transaction if no drivers picked up the order. What if the fare comes turns out to be less than what I prepaid? The prepaid amount is the minimum revenue you offer the driver in exchange for picking you up in a speedy fashion, so you shouldn't expect the driver to return any change on your prepaid amount. Any unanswered questions we missed? Send us an email!